You can easily buy your The Band’s Visit on Broadway tickets before you go to New York. Buy your theatre tickets online, to save time and money. This show can be seen in the Ethel Barrymore Theatre. 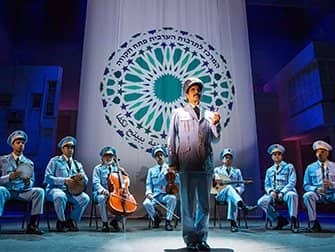 The Band’s Visit, based on the 2007 film of the same name, tells the story of an Egyptian police band on their way to perform a concert in Israel. When they come to cross the border, however, something goes wrong and they find themselves in a totally different place than they had expected. The Band’s Visit won 10 awards at the 2018 Tony Awards, including Best Musical. Confusion arises upon arrival at the border! Consequently, the band is not sent in the direction of the Arab Culture Center concert, but to a remote village in the Israeli desert. The village is so small, in fact, that there are no hotels and no sign of any available public transport. Luckily, the band is taken care of by the locals and a special bond between the villagers and their unexpected visitors develops. There is even a romance between the band leader and cafe owner Dina. The special story is enhanced by Middle Eastern music and lyrics by David Yazbek. 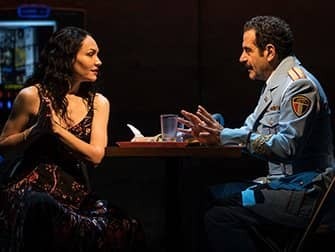 The Band’s Visit has received much praise and within a short time, has become a must-see on Broadway! How to buy The Band’s Visit Tickets? It is easy to buy tickets for The Band’s Visit with the link below. I recommend buying tickets online before your trip to New York. Why? A lot of shows are very popular and are often sold out. You’ll also save time and money and most importantly you don’t have to stress about finding tickets when you are in New York. Eric’s Tip: The Band’s Visit is a musical that packs a punch, even in it’s short 90-minute run. I would recommend seeing it if you don’t want to see the usual 2-2.5 hour musical. If you have an affinity with Egyptian or Israeli culture , you’ll understand the nuances better. Nevertheless, it’s a touching musical. Minimum age: Recommended for ages 12+. Children under the age of 4 are not permitted in the theatre. Don’t want to see The Band’s Visit?